The idea of law is complex. At various times in the history of the human social structure, who decided what was acceptable and just how that was to be defined changed radically. Usually whoever held power in a culture defined what was just. However, when the people who held power became corrupt, all bets were off. The earliest known example of laws actually committed to stone are Hammurabi’s Code. The Code of Hammurabi is a set of Babylonian laws practiced in ancient Mesopotamia beginning around 1750 BCE, a couple of hundred years before Biblical scholars believe Moses descended Mt. Sinai with a better known set of laws. The 282 laws described in the code not only outlined what was legally acceptable under the reigning Babylonian king, Hammurabi, but also provided nuance and grading to laws. For example, an oft-practiced ancient law was “an eye for an eye.” Under Hammurabi’s Code, consideration was given to who the eye was being taken from as well as who was taking the eye. From day one, people have been in the practice of negotiating the law. In the series opener of Better Call Saul, we find our protagonist, Jimmy McGill attempting to negotiate life as well as the law. In his first courtroom appearance on the show, Jimmy attempts to negotiate the finer points of whether defacing a corpse can be explained away as “boys being boys.” A simple screening of the boys’ actions before the jury puts Jimmy’s argument to rest. In part II of the opener, Jimmy’s negotiating skills are put to the test in a situation where his “clients” won’t emerge from the “court” in one piece if he isn’t convincing. Ironically, in this scene, the Code of Hammurabi is directly invoked. In a beautiful display of art, the “courtroom” Jimmy tries his “case” in is the desert outside of Albuquerque. This certainly isn’t the first time that the New Mexican desert has served as a courtroom. Classic westerns from throughout the last century established the gold and blue (traditionally colors of the King used throughout the palace) desert as the locale where justice was measured and punishment handed out. There is a symbolism at play when the desert is used as a courtroom. There are no resources available to the accused. It is a barren landscape where only the truth can be seen. The innocent will emerge from the desert and the guilty will not. Watching Jimmy negotiate justice for the twins he led down a corrupt path is classic western heroism at it’s finest. Jimmy is found innocent of his own “crimes.” He is allowed to leave the desert. He can walk away. But he can’t live with himself if he doesn’t TRY to see justice carried out for others. It’s interesting to note that Jimmy doesn’t try to convince the “court” to simply let his “clients” go with no punishment. He knows if justice is to be served, there must be some punishment – which is how we arrive at the subject of broken bones. I can already tell I’m going to enjoy watching Jimmy McGill wrestle with the law every week. I don’t think Better Call Saul is going to mirror the journey of Walter White in Breaking Bad. I don’t believe we are going to watch the downward spiral of Jimmy McGill into Saul Goodman. I could be wrong, but something in Jimmy’s story feels like he is searching the best version of himself. Something tells me that we will see Jimmy make PLENTY of mistakes and wrong decisions. However, this show feels like it’s about a man having to make choices between terrible options, not a man whose greed and selfishness provide us a steady stream of comic jollies. Jimmy McGill is on a journey. “I’m not backsliding. This is not Slippin’ Jimmy,” he tells us early on in the show. Jimmy is not a man who can leave partners (in crime) to die in the desert. Jimmy is not a man who stares on with a blank look as his partners receive the justice they so richly deserve. It’s hard for him to watch. His conscience betrays his face. He is a man trying to balance the law with justice, mercy, and even grace. It’s hard to have a conversation about a man trying to balance the law with mercy and grace without mentioning the Apostle Paul. Of course, before his conversion, when he was breaking the bones of Christians, Paul was actually called Saul. This isn’t the only mention of a Saul in ancient Holy texts. King Saul was the first man to rule over the united Kingdom of Israel, only to fall on his sword when a battle took a turn for the worse. We will no doubt see Jimmy McGill fall on his sword and become Saul Goodman. 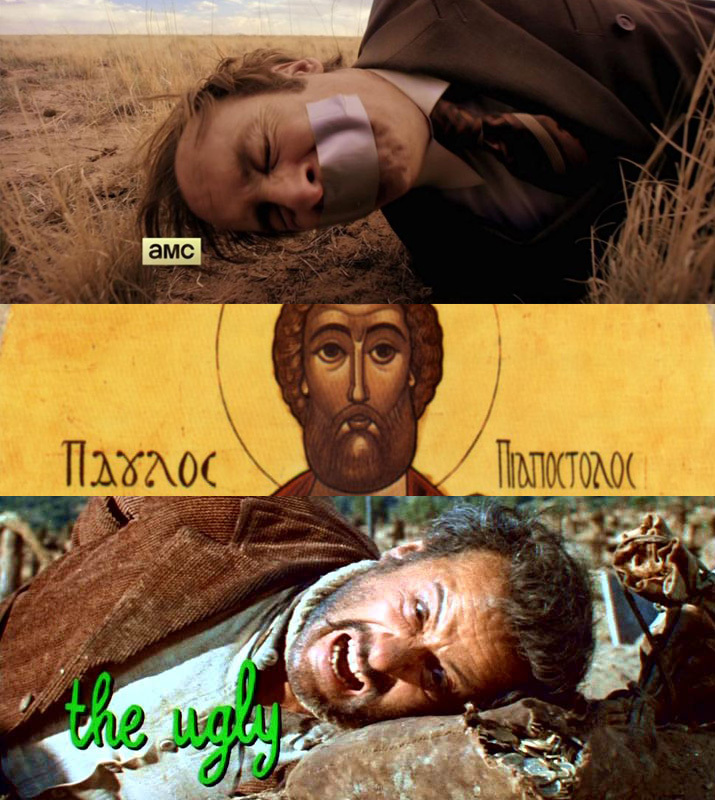 What I’ll be waiting to see is if we eventually see Saul have a “Damascus Road” experience that changes him. Is the man working at the Cinnabon in Omaha a shell of what used to be? Or is that PAUL Goodman? Vince did a Reddit AMA (ask me anything) yesterday. Unfortunately I was too late, but I was surprised no one asked about his thoughts on choosing the name ‘Saul’. Your blog is the only thing on Google thus far that had made this connection. I totally agree with your thoughts, but do you think this was intentional? Saul of the Bible is a very controversial and conflicted individual just like Jimmy. I would really love to see the show take this connection and explore it more in future seasons. Do we have a name for post-Breaking Bad Saul? If it turns out to be Paul I’d say we have a definite answer! YES! I really appreciate you comment and have been surprised that no one else has been delving into the name SAUL. I believe that nothing on Breaking Bad or BCS was by accident so I have to believe the name SAUL was intentional. I hope more is revealed as the seasons of BCS progress!